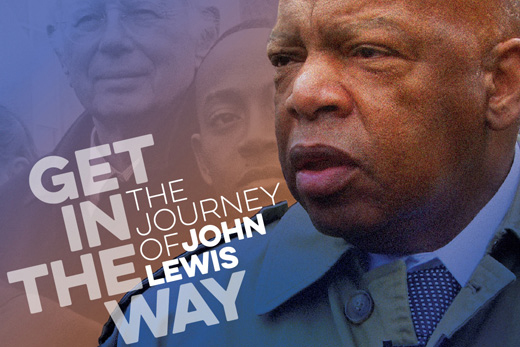 Emory School of Law will screen "Get in the Way: The Journey of John Lewis," on Saturday, March 26. The event includes a panel discussion with Congressman Lewis and film director Kathleen Dowdey. Saturday, March 26, at 6:30 p.m. The event opens with a reception at 5 p.m. and features a panel discussion with Lewis and director Kathleen Dowdey at 6 p.m., followed by the film showing. The event is free. When U.S. Rep. John Lewis was a child growing up in the segregated South, his mother gave him advice that he refused to heed, but still recalls: "My mama told me not to get in the way, not to get in trouble," Lewis says in a new film about his life. "I got in trouble." Emory School of Law will screen "Get in the Way: The Journey of John Lewis," on Saturday, March 26, at 6:30 p.m. in Tull Auditorium, Gambrell Hall. The event, sponsored by Atlanta Gas Light, opens with a reception at 5 p.m. and features a panel discussion with Lewis and director Kathleen Dowdey at 6 p.m., followed by the film showing. The event is free, but you must register. "Get in the Way" is a biographical account of Lewis' legendary, lifelong fight for racial justice and the ways he chose, always nonviolently, to trouble the conscience of American society. Born to sharecroppers outside Troy, Alabama, Lewis asked "why" in the face of "colored" and "white only" signs in his hometown. Inspired by the Montgomery bus boycott in the mid-1950s, he joined the era's lunch-counter sit-ins, was a Freedom Rider challenging the segregation of interstate buses and became a founding member, and later president, of the Student Nonviolent Coordinating Committee. At the age of 23, Lewis was an architect of, and keynote speaker at, the historic March on Washington in 1963. On March 7, 1965, he and Hosea Williams led 600 marchers across the Edmund Pettus Bridge in Selma, Alabama. As the marchers stopped to pray, they were beaten with nightsticks and pelted with tear gas; Lewis's skull was fractured. Before being taken to the hospital, Lewis spoke in front of television cameras, calling on President Johnson to intervene in Alabama. Eight days later, the president appeared before a joint session of Congress to demand passage of the Voting Rights Act. As Lewis' friend and former college roommate, Bernard Lafayette Jr., a distinguished senior scholar-in-residence at Emory's Candler School of Theology, comments in the film, "John put the force of his soul against the system." Each additional step in Lewis' career — from serving as director of the Voter Education Project to heading the federal agency ACTION under President Jimmy Carter — has demonstrated the courage and resolve for which he is admired. In 1986, Lewis, whose own parents had been prevented from voting, was elected to represent Georgia's Fifth Congressional District, winning reelection since then by overwhelming majorities. In 2010 Barack Obama awarded him the Presidential Medal of Freedom. Dowdey, the film's director and producer, has a background in documentary filmmaking, including the theatrically released "A Celtic Trilogy." Her narrative feature, "Blue Heaven," examined the hidden world of domestic violence, while "Dawn's Early Light" was a biography of Southern newspaper editor and Pulitzer Prize-winner Ralph McGill. Emory Law is a fitting venue for an event in honor of Lewis. He was awarded an honorary doctor of laws degree at Emory University's 2014 commencement, where he was the keynote speaker, and also spoke at the Emory Law commencement the same day. "Our country is a better country and our people are a better people because of the law," Lewis told law students then. "So go out there and do your best to seek justice. And never, ever turn back; never, ever give up; but keep the faith and continue to work for what is right, for what is fair, and for what is just." In April 2015, Emory Law received a $1.5 million donation to establish a John Lewis Chair in Civil Rights and Social Justice. "Honoring John Lewis — someone who is so important to the conversation on civil rights — is a wonderful way to inspire the Emory community with our ongoing commitment to social justice and academic excellence," Dean Robert Schapiro said at the time. "The gift builds on Emory's history as a leader in civil rights and social justice, dating as far back as the 1962 lawsuit that helped integrate private colleges and universities in Georgia."